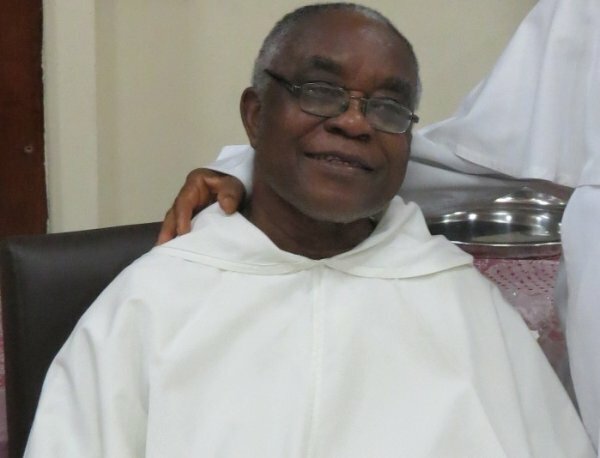 OP Release: The Province of St. Joseph the Worker, Nigeria and Ghana has lost its very first Nigerian Dominican, Brother Chukwunonye Linus Osunwoke, O.P., popularly known as Brother Nonye, aged 85 years. He was a Cooperator Brother. Born in January 15, 1933, he joined the Order in the early 60s, made first profession on October 7, 1964 and solemn profession on October 7, 1970. Brother Nonye established the popular Dominican Arts in Ibadan in the early 70s. It was well known in Nigeria for the design and production of church vestments and robes, and African traditional wears. In 1977, he went to the United States for the provincial chapter in River Forest. After the Chapter, he was approved to do some studies in the United States. In 1985, he came back with a Masters degree in Clinical Counseling. On his return to Nigeria, he was assigned to the formation house, Ibadan, as Assistant Student Master, (my Assistant Student Master). He loved farming; in the early 1990s, he got over 30 hectares of land and started the Ibadan Farm Project, known as “Moniya Farms”, which today is the Center for Human Resources and Development. As he advanced in years, he was transferred to St. Dominic Catholic Church, Yaba, Lagos. He was fully involved in the pastoral life of the parish, teaching catechism to the young and old, had ministries to different pious societies in the parish, marriage preparation, administered Holy Communion to the sick and elderly, and helped with the distribution of Holy Communion on Sundays and weekdays, a major ministry in the parish. Brother Nonye was very faithful to this service until his health started to fail. He was also the sacristan for the priory chapel. Brother Nonye loved his Dominican life and gave all of us a great example. He had a very strong and disciplined personality. As our Assistant Student Master, we used to call him “Lion”. However, he was at the same time a jovial person, and very free with the younger brothers who called him “fellow novitiate”. He loved community life and activities and was regular in observing them. He was regular at community rosary and often led it. He was very meticulous in maintaining the sacred vessels, linens and clothsin the priory chapel. One would often find him alone in the chapel praying the rosary. He remained strong in health until he celebrated his 80th birth anniversary five years ago. Immediately after that celebration, his health went south. He started becoming weak, there was no specific sickness but he could no longer climb steps easily or do what he regularly did before. He held on to his faith to the end. On January 15 this year, the brothers in St. Dominic Priory celebrated his 85th birthday in his room, sang for him while he watched gleefully. That was his last birthday as he died on February 17. He will be laid to rest at the provincial cemetery, St. Thomas Aquinas, Priory, Ibadan, on March 2. May the soul of Brother Nonye and the souls of all the faithful departed through the mercy of God rest in peace.